The Mosca Pass trail is located in the Great Sand Dunes National Park and Preserve and the Sangre de Cristo Wilderness area in south central Colorado. 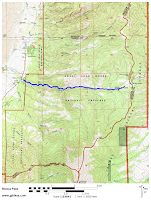 The trail begins at the Montville trailhead where it climbs through a canyon of the Sangre de Cristo mountain range, gaining over 2300 feet of elevation, and comes to an end at a Forest Road that comes up from the east side of the mountain. The route has been in use for thousands of years by Native Americans and it is was even used by Lt. Zebulon M. Pike, John C. Fremont, Kit Carson and many others. Follow the directions in the Great Sand Dunes post to get to the area. After passing the Visitor Center take the first right into the Montville trailhead parking area. From the trailhead take the right fork of the Montville Nature trail. Stay to the right as you hike along the nature trail. As the nature trail nears its easternmost point it crosses a bridge over Mosca Creek and comes to a junction where it is joined by the Wellington Ditch and Mosca Pass trails. Take the right fork that continues eastward up the canyon for the Mosca Pass trail. The Mosca Pass trail begins climbing away from the Montville Nature trail at a moderate pace. With an average grade of 13% the climb tends to stay in the moderate category. For those that aren't in good hiking shape or that aren't used to hiking in the mountains the hike may feel more strenuous. As the trail approaches the 3/4 mile point in crosses into the Sangre de Cristo Wilderness Area. After passing this point backcountry camping is permitted. If backpacking in the wilderness area be sure to choose a camping spot that is not within site from the trail or any other camps and follow all other rules that pertain to wilderness areas. More information can be obtained from the rangers at the Visitor Center or the Wilderness website. A good portion of the trail is shaded by tall stands of pine, spruce and aspen trees. The canyon opens up as the trail gains more and more elevation. Near the upper trailhead the landscape changes into open parks and meadows. The photos for this post were taken during the first week of June. The trail was clear of snow but there were a few small patches still remaining in the shady areas of the north facing slopes. At this elevation the willows and aspen trees were just beginning to bud. With the temperatures in the 60's F the hiking was pretty much perfect. Backpackers will find it easier to find a place to make camp once the trail flattens out near the meadows. Just like any other mountain area at this time of year there were a few sections of the trail that were wet. These spots were easy enough to hike around but since the ground was firm and we were wearing waterproof Solomon boots why bother. 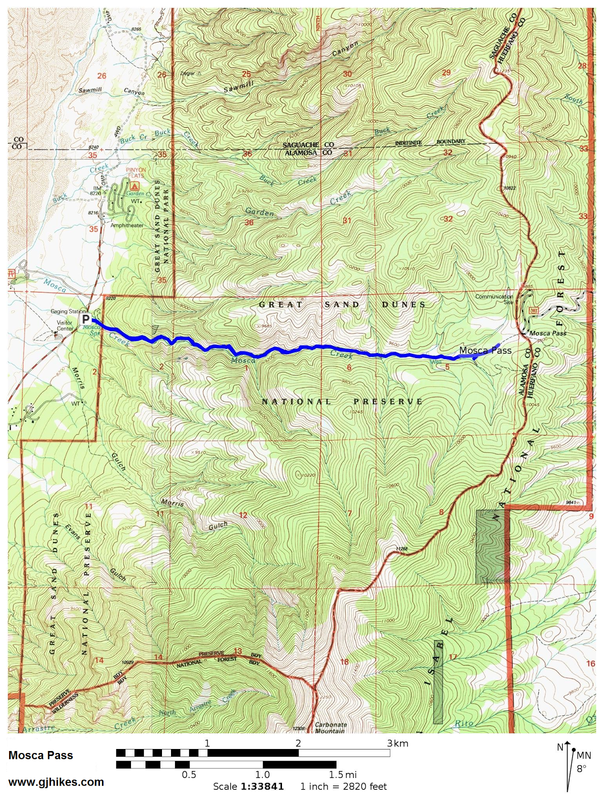 There is a faint trail that connects on the right near the 3 mile point and not too far from that the Mosca Pass trail crosses the wilderness boundary once again and reaches the turnaround at the upper trailhead. The trip back down the pass can go rather quickly with gravity being your best friend in that direction. Mosca Creek was flowing plenty of water at this time of the year. It might only have a seasonal flow though so be sure to check it at the trailhead if you are planning to filter water from it for drinking. Since the trail only takes about 3 hours hikers will be able to carry enough water with them but backpackers on the other hand may not. It is always fun to hike a trail with such a rich history as Mosca Pass. If you would like to see it for yourself then all you have to do is 'Take a hike'.